This is an all-hands-on-deck call for parents and educators to join us in defense of play! We have all seen the growing “academicization” of early childhood education, and the disappearance of play. We’ve seen preschool become kindergarten and kindergarten turn into first grade. Parents are holding children back until they are ready to fit into this new curriculum, which no longer fits the child. We need to say Enough! and make our voices heard. I toured a prospective parent the other day and found myself, once again, in a discussion about developmentally appropriate curriculum. Developmentally appropriate simply means that you meet the child where s/he is (cognitively, socially, physically, emotionally) and don’t expect that child to do what they can’t. 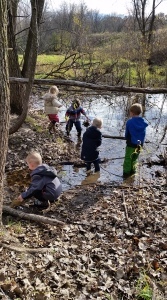 That’s not to say we don’t challenge children and encourage them to take risks, but we do it within a reasonable range, without a steady diet of being “stretched.” The central axis of All Season’s three-part mission as an intergenerational, art and nature-based program is PLAY. 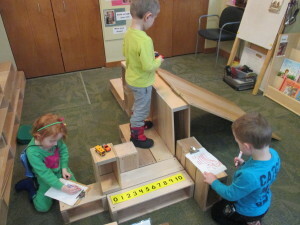 Developmentally appropriate learning for young children happens mostly through play and in a relevant context, not through filling up workbooks or sitting at tables for math lessons. Educators and parents see children become absorbed for long periods of time in an activity of their own choosing, demonstrating creative and problem-solving abilities far beyond the adults’ expectations. Without constant adult direction children are capable of stretching and challenging themselves. Many of you are on the play/developmentally appropriate bandwagon already or are ready to hop on. I’d like to encourage you. This shift away from play-based practice happened partly out of anxiety and fear surrounding the achievement gap between groups of students, but research shows it has backfired. Now we need to push back. This challenge is a bit like changing the course of an ocean liner, but it can be done. Recent changes in federal policy have shown that the government can be responsive to public dissatisfaction. 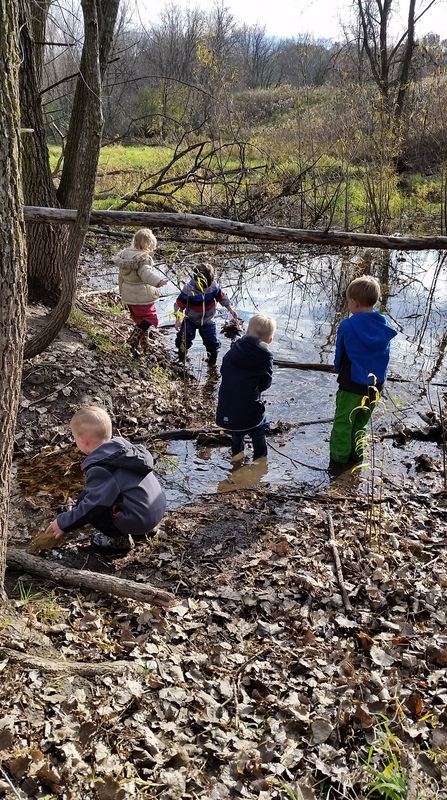 When your child moves on from this idyllic early childhood setting, find the change you’d like to see in your next school and make it happen. You can begin with finding a couple other parents who want a recess for their first graders, or want to keep the big blocks and doll corner in the kindergarten room. Find an ally or two—there are others out there—and take the first step. Teachers, principals, superintendents and beyond will eventually take notice of these brave voices. We’ll do our part by protecting the primary role of play in preschool. Find your cause, your first small step beyond All Seasons. LaRue is a busy lady, often not home when we are out visiting, so we taped a note to her door asking about her kitten family. Soon she wrote us back! The children were excited to receive her response. LaRue told us the kittens did not have names, but would we name them for her? This became a project of great excitement for the Autumn Room. Children made lists of possible names and created drawings of the three cats. After a vote, name winners were: Cookie for the black and white cat, Fluffy for the white one, and Cheeto-Burrito for the orange kitten. 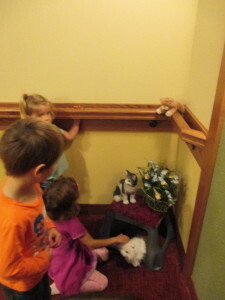 Each time we visited LaRue, she invited us inside her home. Low and behold, this grandma had MANY MORE CATS inside her apartment! With each visit, she had a new one to show us. 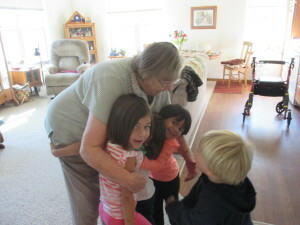 The children love to visit LaRue and started calling her “The Cat Grandma.” Excited shouts of “Hi Cat Grandma!” are heard whenever we encounter LaRue. Each time she reminds the children to come play with her cats. Ah, the teacher becomes the student. For me, her simple statement highlighted the essence of visiting LaRue. This is not a meaningless visit; this is the real thing. Our time together reflects mutual love and respect. This is what I want to teach. 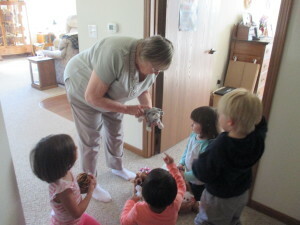 At LaRue’s we have performed impromptu puppet shows, sorted cats by characteristics, named more cats than I can recall, looked at her family photos, observed her collection of handmade carvings, described Christmas decorations, tried out her many chairs, listened to stories about her life, and given hugs many times over. LaRue describes these visitors as “her preschoolers” and has told me she sees these children more than her own grandchildren or great grandchildren. We are her family and she will always be our Cat Grandma.